We’re so excited to have created this box with Amelia’s help and her beautiful recipes inspired by the very same farms we buy from on a weekly basis. What a perfect way to celebrate the arrival of spring, and celebrate our community, as farmers plant for summer and the seasons shift into a new wave of crops. 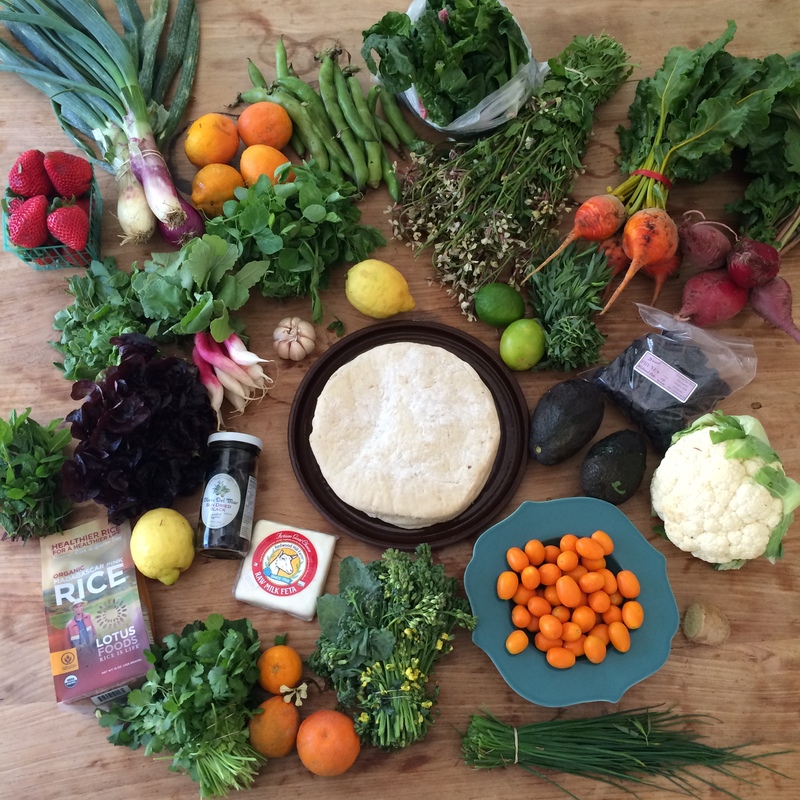 I’ve been shopping and cooking in season from the bounty of local farms for many years and am happy you too are exploring this way of feeding your family. Small-farmed crops introduce us to new ingredients and give us the best-tasting, healthiest versions of our old favorites, including carefully raised meats and dairy products. By sourcing from small producers, we help family farms and farmland survive. And because ingredients grown in their season taste best, it’s fast and easy to prepare a delicious dinner. I hope you find my recipes helpful in expanding your ingredient repertoire.” – Amelia Saltsman, author of The Santa Monica Farmer’s Market Cookbook. The meal plan this week is full of beautiful dishes which celebrate our seasonal foods, and a few ingredients which might be new to you. Enjoy cooking and sharing these lovely meals.